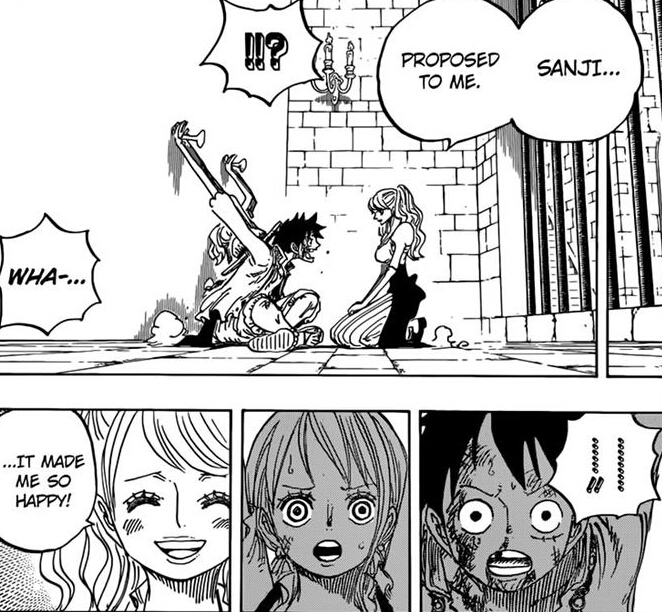 One Piece 849 Spoilers!!! One Piece 849 Prediction and Discussions!!! One Piece 848has been released now!!! Read it now!!! Chapter title is Chobro in Mirror World. In the cover page, protagonists in other Shonen Jump mangas wear ONE PIECE characters’ costumes. Carrot is about to be thrown into a furnace, but actually it is not real Carrot. It is a frog whose shape is the same as Carrot somehow (Brulee’s DF?). Real Carrot is hiding in an attic. Carrot makes a sneaking attack and saves the frog. She turns over the furnace. Brulee is shouting due to the hot water. Randolph gets an electrical shock due to the hot water attacked by Carrot’s Electro. Chopper goes on a rampage via Brain Point and Ramble Ball. They finally take control of Mirror World. Sanji cooks a dish for Pudding, who was not in a good mood. Pedro confronts with Tamago. Pedro’s 50 years’ life span was taken by Big Mom when he was captured 5 years ago. Reiju is heading for somewhere with her body/face full of blood. Brook is the only known person to have a wanted poster that is not formatted in the uniform style.